How To Prepare Your Home Of The Future - Now. How To Prepare Your Home For the Future – Now! 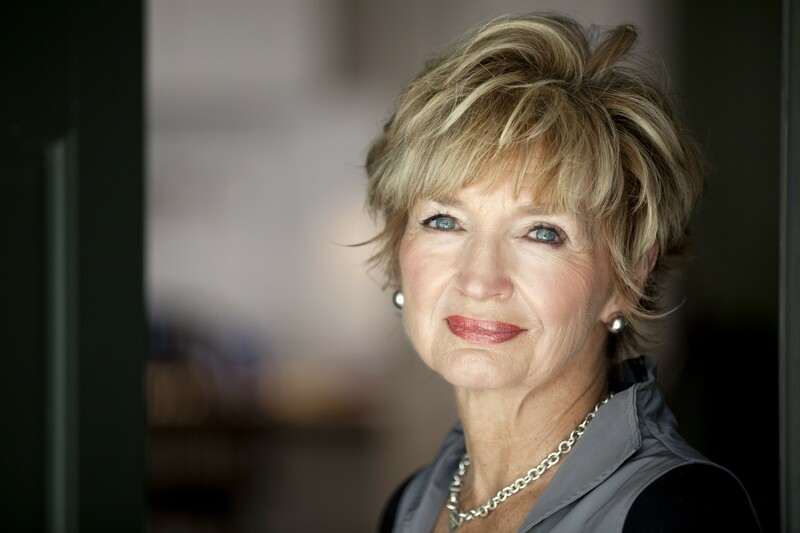 Fellow boomers, if you’ve been reading my #BoomerSmarts Blog for any length of time, you know how strongly I feel about preparing our homes for all eventualities, before a crisis hits, no matter what our ages are. You might even have watched my * how to * videos over on You Tube and The Design Network. You may also know how my husband Bob and I have done this with the home we bought and remodeled from the ground up after our 3 children left home, that I use as a *living laboratory* to showcase to my local interior design clients here in Wichita what a difference a home designed like ours can make to their quality of life. 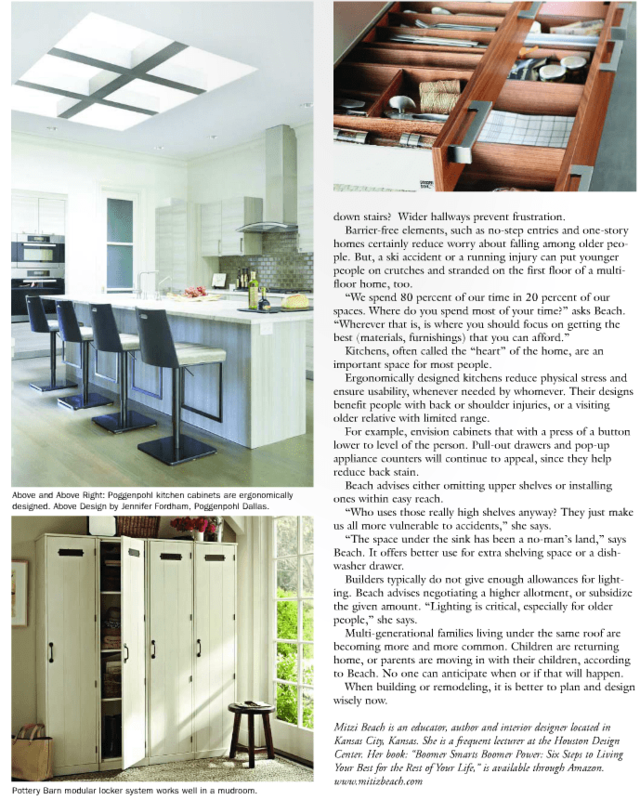 Yesterday, I was very excited to see this article go live, published in Houston’s House & Home magazine, which contains an interview with me conducted by Susan Fox late last year, after she saw me deliver my CEU at the Houston Design Center last fall on *Boomer Homes Of The Future.” What caught Susan’s attention was how I spoke about the home of the future’s universal design principles being important for all ages – and not just boomers. As I get ready to attend the National Kitchen and Bath Association’s annual tradeshow in Las Vegas tomorrow as part of Modenus’ #BlogTourVegas with 18 of my fellow designers and talented blogging friends, I hope you will come back often to visit the #BoomerSmarts blog over the coming weeks. I will be sharing the products from our #BlogTourVegas sponsors, like the ergonomically designed kitchenc cabinets from #BlogTourVegas sponsor, Poggenpohol – shown in this article by chance – and curating for you other new kitchen and bath products I find that are chic and beautifully made, yet contribute to a healthier cooking and kitchen environment for you, as well as a safer, more relaxing spa-like bathroom environment for your #BoomerSmarts homes. 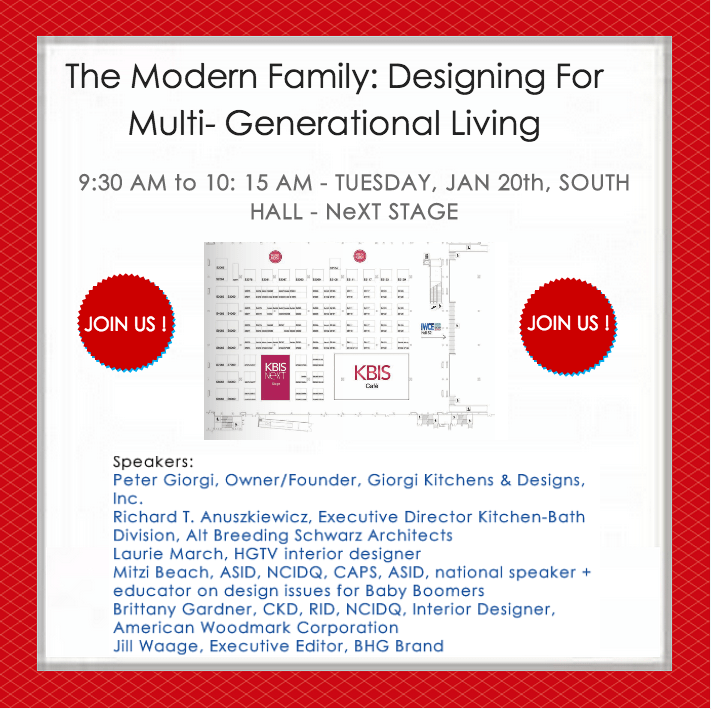 And, if you’re reading this and attending the #KBIS2015 show, too, as either an exhibitor or an attendee, and you have an interest in this topic, I invite you to please attend the panel I’m part of on Tuesday morning, Jan. 20th, beginning at 9:30 on THE MODERN FAMILY – DESIGNING FOR THE MULTI-GENERATIONAL HOME, being held in the South Hall on the #KBISNeXT stage. 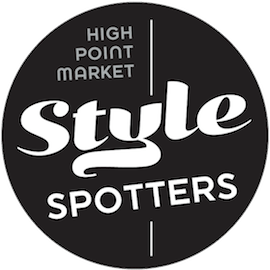 It is being moderated by Jill Waage, the senior editor for home content for BHG – Better Homes and Gardens magazine – and we will be discussing some more of the ideas that are mentioned in the above article. 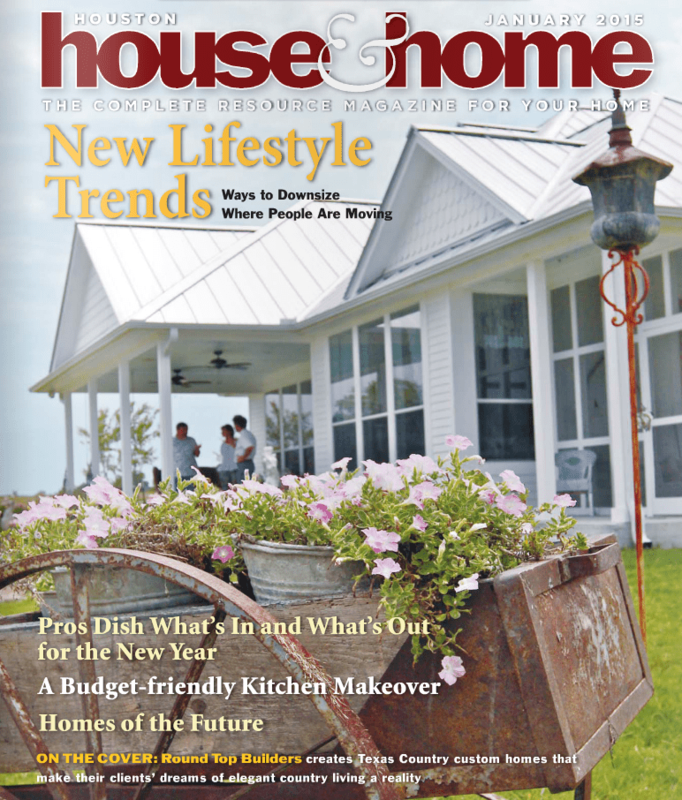 #KBISNeXT, and/or my trademarked #BoomerSmarts tag and my new hashtag for 2015, #HealthyHomes. 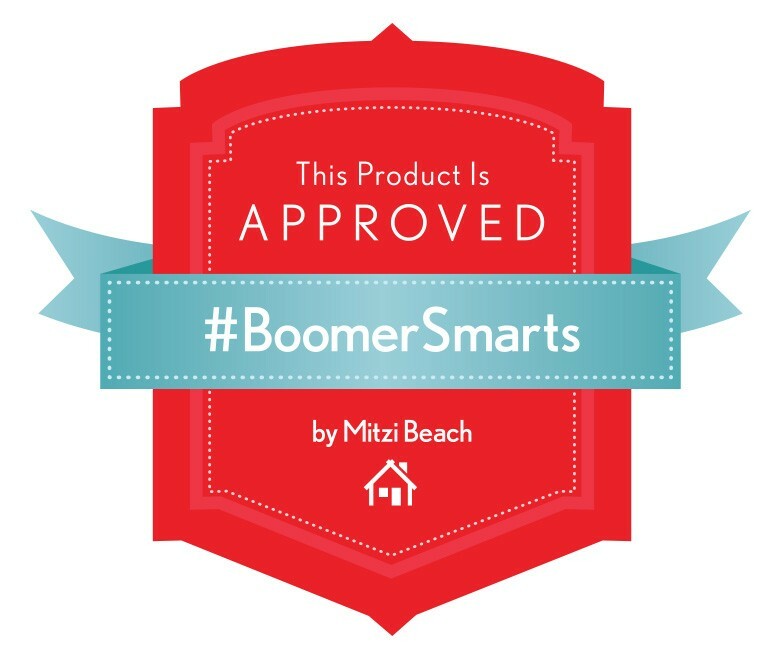 And if you’re an exhibitor attending the show reading this – interested in utilizing my new #BoomerSmarts seal of approval badge on your own websites and in your own marketing materials – please contact me at the show or afterwards via https://mitzibeach.com/contact . Live Healthy. Live Happy. Live #BoomerSmarts. 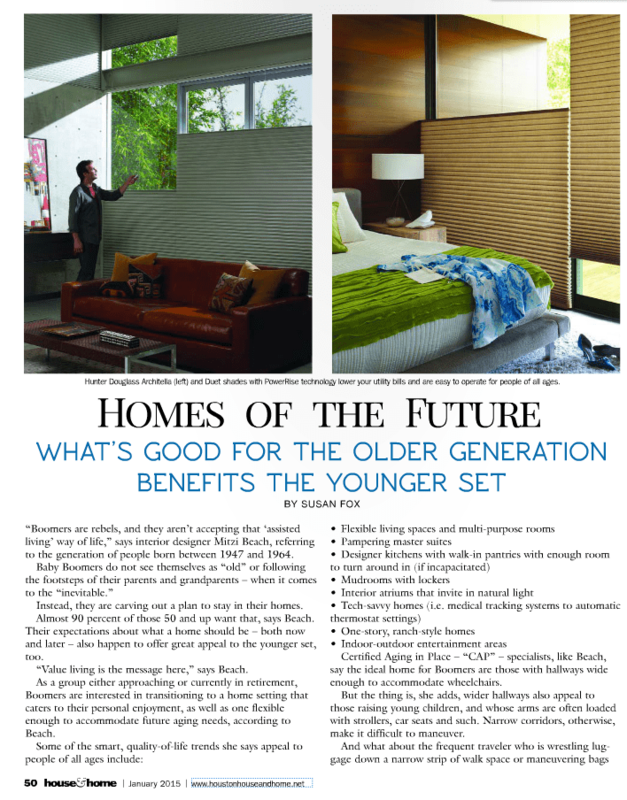 America’s Trusted Online Resource For The Products, The People and The Places That Care About Creating The Healthy Homes Of The Future For America’s 78 Million Baby Boomers. I invite you to please follow me on my other social channels, too, by clicking on the links below. This entry was posted in Aging in Place, Design and tagged articles on universal design, asid, best blogs for baby boomers, Houston, Houston House and Design, Houston univeral design homes, inteior designer, interior design blogs for baby boomers, interior designer, Kansas, magazine articles on universal design, Mitzi Beach, Texas, universal design for baby boomers, universal design principles, universally designed products for bathrooms, universally designed products for kitchens, WIchita. Bookmark the permalink.